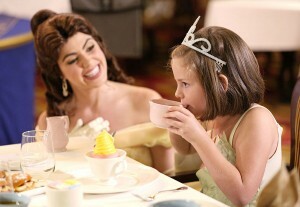 The Disney Princesses arrive at the tea and visit each table during the event. Guests at Royal Court Royal tea are treated to delicious food and drinks by Lady Chamomile, the Royal Tea Hostess, and Chef Brule, the Royal Pastry Chef. And, each prince and princess leaves the party with a keepsake and a photograph with their favorite Disney Princess. Guests can visit the Planning Center on disneycruise.com or visit Guest Services on their first day on board to add their names to the invite list for the Royal Court Royal Tea.